The emergence of discourses around resurrection within Judaism and Christianity has long interested scholars. Unfortunately, accounts of the nature and development of resurrection belief in antiquity have frequently imposed upon it oversimplified narratives and frameworks, obscuring its considerable diversity and complexity. C. D. Elledge’s 2017 monograph, Resurrection of the Dead in Early Judaism, 200 BCE—CE 200, serves as an important corrective to this trend. 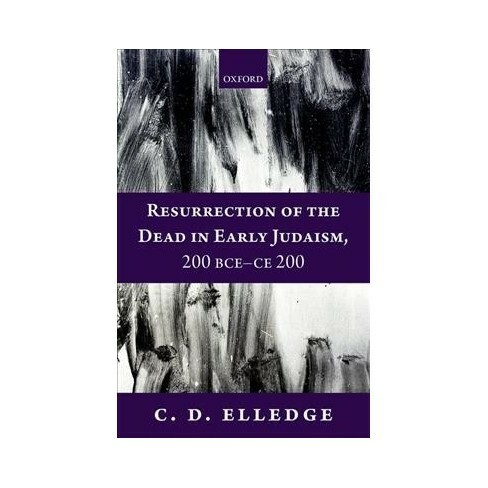 While early Jewish evidence for resurrection is often considered primarily as a stage in the linear development of resurrection belief as it eventually emerged in Rabbinic Judaism and early Christianity, Elledge provides in-depth analysis of this evidence in its own right; later evidence is considered largely as it illuminates the early Jewish materials. As Elledge argues, evidence for resurrection belief in texts such as the Book of Daniel, the Apocrypha, the Pseudepigrapha, the Dead Sea Scrolls, and the writings of other Hellenistic Jewish authors is sufficiently diverse as to warrant careful reexamination. Although resurrection in this context often resembles other contemporaneous conceptions of afterlife, particularly the idea of immortality of the soul, Elledge adopts a working definition of resurrection as distinguished by both the exercise of divine agency and the transformation into a new, qualitatively different form of life. Even within these narrow constraints there exists a vibrant array of expressions of resurrection, and Elledge’s textual analyses are particularly attentive to differing interpretations of embodiment (what role do a person’s physical remains play in post-resurrection life?) and spatiality (where in the cosmos does resurrection take place?). For Elledge, the complexity of the evidence demands the reevaluation of a number of scholarly assumptions. In addition to the tendency to retroject later theories of resurrection onto the early Jewish materials, Elledge also challenges the dichotomous “history of religions” approach to the origin of Jewish belief in resurrection (was it an internal Israelite development, or the result of foreign influence? ), as well as the “myth of dominance” (the idea that resurrection had gained widespread acceptance among Jewish communities by the first century CE). Elledge prefers instead to approach early Jewish resurrection belief as emerging from a “matrix” of Israelite-Jewish and external influences (7), as communities individually responded to foreign oppression and managed resulting internal tensions. In this context diverse beliefs about the resurrection arose, offering an alternative model to the one proposed by the “myth of dominance.” As various groups attempted to articulate their conceptions of life, death, and divine judgement, a number of views about the afterlife emerged, without any one form of belief proving dominant. As one among multiple models of afterlife available in early Judaism, Elledge suggests, resurrection in its various forms is best understood as a “specialized eschatological discourse” that was “paradoxically both popular and controversial” (13). Careful analysis of resurrection belief, both in the context of alternative conceptions of afterlife and as a complex and multivalent phenomenon in itself, constitutes a vital opportunity to apprehend “the prolific creativity of early Jewish theologies” (17). Like early Judaism broadly conceived, resurrection belief existed on a spectrum; it was, Elledge argues, this very diversity that made the discourse on resurrection so adaptable, and, consequently, so popular. The book’s second chapter illuminates, through careful analysis, the considerable conceptual diversity of resurrection belief as expressed in early Jewish texts. Elledge attempts to discern how various literary sources understand a person’s physical remains to participate in post-resurrection life, as well as what new forms of embodiment the resurrection might involve. While it is often difficult to determine exactly what sort of resurrection authors envision, the texts seem to articulate a range of expectations about embodiment: while some describe varying degrees of continuity between the earthly body and the post-resurrection body, others envision a spiritual or intellectual resurrection, while still others speak of resurrected beings using cosmic imagery (stars, heavens, angels). There is a similar lack of consensus, as Elledge demonstrates, around the issue of where the resurrection occurs. Authors place resurrection in both heavenly and earthly realms, as well as within “the present structures of existence” (42), in a radically different cosmos, and in various versions of an idealized past. The third chapter explores questions of the origins and contexts of early beliefs, which, in light of the complexity of the evidence presented in the second chapter, defy simple or linear explanations. Elledge proposes a more nuanced theory, arguing that beliefs about the resurrection proliferated as various Jewish theologies negotiated questions of death and afterlife within their social contexts. As Elledge argues, resurrection was not the only model of afterlife that emerged from these intellectual interactions; as one option among several, it was both popular and controversial. Given the controversial nature of resurrection belief, proponents of this model of the afterlife relied upon a number of arguments to legitimate it. The fourth chapter provides an overview of these strategies, which include the deployment of earlier prophetic language to articulate hope for a post-resurrection life, the use of creation imagery to argue for God’s power to re-create in the resurrection, and the understanding of resurrection as necessary for God’s judgment to take place. In contrast, the fifth chapter explores discourses of afterlife denial in early Judaism. Elledge highlights the ways in which those who rejected the possibility of resurrection interpreted scriptural (particularly wisdom) traditions to legitimate their position, emphasized the continuity of the Jewish people on earth over against that of individuals after death, and positioned divine reward and punishment in this world rather than in a life to come. In a setting where denial of the afterlife was well established, resurrection represented an “insurgent and controversial theodicy” (106), generating conflict not only concerning ideas of afterlife but also around broader issues of theology, theodicy and scriptural interpretation. As models of afterlife in early Judaism were not limited to resurrection and its denial, the sixth chapter focuses on the “counterpart” to resurrection, namely immortality of the soul (107). As Elledge points out, both approaches could be substantiated through earlier scriptural traditions and involve a degree of corporeality or materiality. Nevertheless, the two concepts relate differently to questions of divine agency: if immortality is understood to be an innate property of the soul, the soul’s survival in the afterlife requires no specific divine action. Similarly, while resurrection often necessitates a “radical reconfiguration” of the structures of the present world, immortality may be “relatively less disruptive” (109). A substantial amount of variation exists even among sources that advance a vision of immortality, as they borrow variously from Greek popular and philosophical models of immortality and synthesize them in different ways with Jewish scripture and thought. In a departure from these thematically-focused chapters, the seventh, eighth and ninth chapters feature detailed analyses of resurrection as it appears in specific bodies of evidence: the Book of Watchers, the Dead Sea Scrolls, and the writings of Josephus. As the earliest evidence (third century BCE) for resurrection belief in the Hellenistic period, the Book of Watchers belies scholarly assumptions that resurrection arose in response to the turmoil of the Maccabean age, potentially adding some (if limited) insight into its historical and theological development. An examination of resurrection in the Dead Sea Scrolls illuminates the ways in which a sectarian community adapted this model of afterlife as it increased in popularity across Judaism more broadly. Josephus’ explicit descriptions of how Palestinian Jews thought about the afterlife, deeply influenced by his rhetorical goals and the ethnographic methods he employs, are both helpful and problematic in the study of resurrection. As Elledge’s book capably demonstrates, it is the diversity, complexity and adaptability of resurrection belief—the very attributes that make it so difficult for scholars to pin down—that characterized and facilitated its growth in early Jewish thought. Rejecting many of the scholarly assumptions around resurrection—its clear origins, its linear development, its dominance—does not diminish, but rather enhances, the degree to which resurrection’s vibrancy and significance within early Judaism may be appreciated. The book’s conclusion undertakes a brief exploration of the ways in which the idea of resurrection was received and reinterpreted in emergent Rabbinic Judaism and Christianity. This work should inspire scholars of these and other contexts to examine beliefs about resurrection with similar care and nuance. Karen Connor McGugan is a Ph.D. Candidate in New Testament and Early Christianity at Harvard University. Her dissertation examines the relationship between the resurrected body and food in second and third century Christian thought. Contact her at karenconnor@fas.harvard.edu. For further discussion of this trend, see e.g. Taylor G. Petrey, Resurrecting Parts: Early Christians on Desire, Reproduction, and Sexual Difference (London and New York: Routledge, 2016), Introduction.